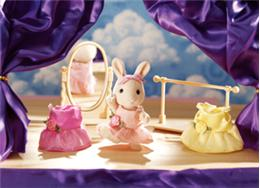 Set includes rabbit sister Britney Periwinkle, ballet bar, mirror and three beautiful outfits for Britney to wear for her recitals! Copyright © 2019 Sylvanian Families - The Wonderful Sylvania Family. All Rights Reserved.